Before the prospective reader even opens Guo Pei: Couture Beyond, they need to be aware that this is not so much about haute couture but rather about the art and craft of haute couture; the ateliers, the specialized and highly specific techniques used in the creation of these haute couture garments, and the reality that in China there Is nothing that is impossible to replicate or create. Any fashion person who has travelled and worked with factories inside China can tell you that indeed they can copy anything, but they are not leaders when it comes to design, no matter how opulent or how simple. Keep in mind that it was a scant three years ago that most of us ever heard of Guo Pei when one of the most extravagant “costumes” (weighing in at 55 pounds) ever created was worn by Rihanna when climbing the stairs to annual the Met Gala. The show was called China: Through the Looking Glass, and this photographic catalog certainly commemorates that and the current SCAD show of Guo Pei’s work. What is striking is that with these images and the excruciating detail that goes into each and every one of the garments is that they take on an almost painterly or two dimensional feeling like the portraits of English, Indian, and Russian royals who are bejeweled and bedecked in their ostentatious and most glorious finery. In other words what we see appears to be almost unreal in the fact they were produced in actual fabrication and not just painted as a flat surface. It is here with this realization that those involved in fashion really can see that there is little, if anything, that cannot be achieved by the “petit mains” (no pun intended) of couture ateliers whether in China or France. 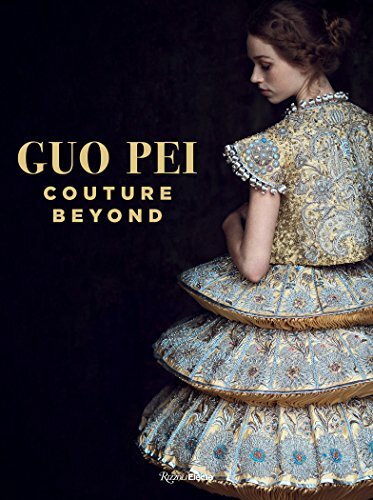 Guo Pei: Beyond Couture may serve as the catalog/monograph for her SCAD show, but serves much more as a testimonial to the unrivaled capabilities that are available in the Far East. The clothes themselves are much more suited to either a costume epic or a museum show rather than being part of anyone’s real life wardrobe. The designer unequivocally has an immense imagination, which, when married to these ateliers, creates some of the most spectacular and sumptuous pieces in fashion today.